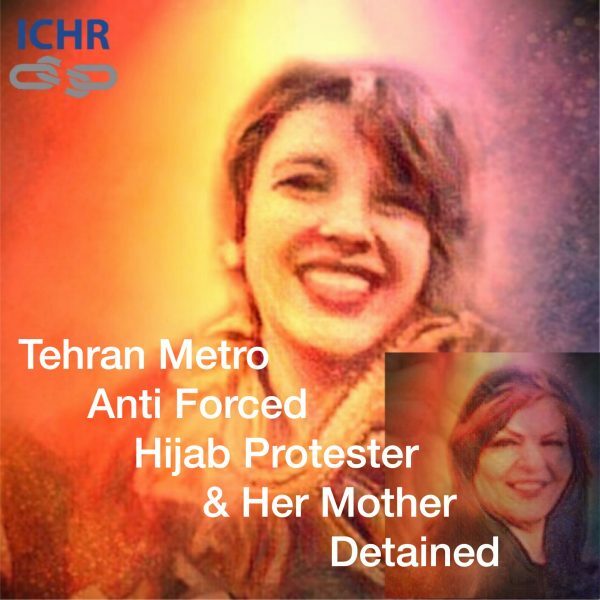 ICHR strongly Calls on Iran’s Government to immediately halt all the bogus charges against Yasaman Aryani and her mother Monireh Arabshahi as well as to release them immediately and unconditionally. Yasaman Aryani was arrested in Tehran on April 10, 2019, after appearing in a widely shared video of women peacefully protesting Iran’s forced hijab laws in a Tehran Metro train on March 8, International Women’s Day. Not long after her mother Monireh Arabshahi was detained the following day after she inquired about her daughter. They are being held in the Vozara Detention Center based on a complaint by the judiciary’s Islamic Guidance branch, according to news reports. Their protest was them not wearing hijab and distributing flowers to passengers in the Tehran while saying they look forward to the day that Iranian women will be allowed to choose whether to wear a hijab or not. Aryani has publicly supported women’s rights in Iran and has advocated peacefully opposing Iran’s forced hijab law. She has also posted many photos and video clips of herself walking without a hijab in the streets of Tehran. ICHR strongly Calls on Iran’s Government to immediately stop attacking, arresting, and sentencing protesters, and innocent people. As well as imminent release of Yasaman and her mother.